Our main goals have been to stay warm and build features to make fundraising a breeze for everyone. We haven’t been doing so well at staying warm, but we have been cranking out some amazing features we’d like to share with you. Before I do that, maybe I should tell you a little about our new focus. We set out to make anyone an expert fundraiser, or at least a more confident fundraiser. If you work at a nonprofit, we want to provide you and your volunteer fundraisers the tools and education needed to be successful. We started by building an online toolkit for anyone doing peer-to-peer fundraising for a nonprofit. People that fall into this category might not work for a nonprofit, or have any fundraising experience, but they really want to help. They thrust themselves into the position of being a fundraiser, but they might not know where to start when it comes to actually fundraising. We realize that this can be awkward and intimidating spot to be in – “Who do I reach out to? What do I say?”. Oftentimes, someone might just share out to Facebook once and be done. This is not an effective form of fundraising. And that’s why we built these tools. These ideas, combined with feedback from nonprofits and fundraisers, morphed over time into actual functionality on the site. 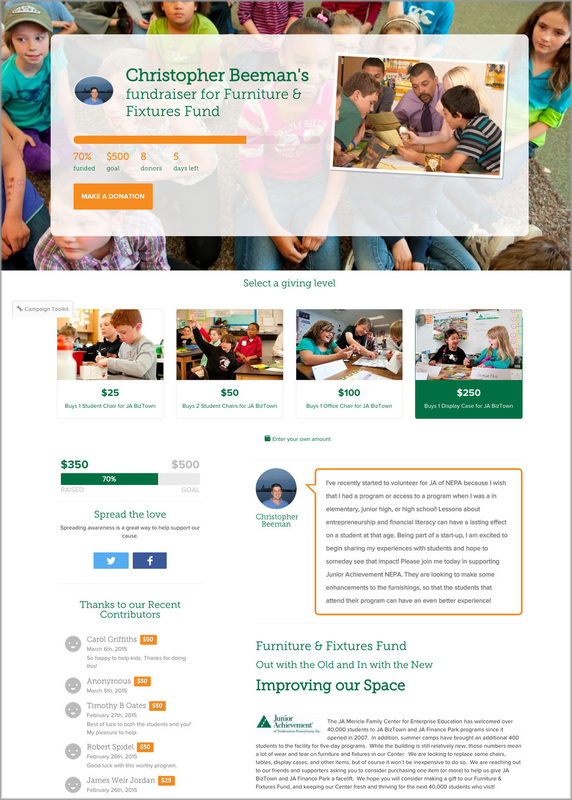 Stuff like allowing fundraisers to create a beautiful page that they can add a personal story and photos to. This takes on the styling of the campaign for which they are fundraising, so it is consistent with the nonprofit’s branding. Fundraisers have access to their “toolkit”, this is a compilation of tips and features to help them raise funds. 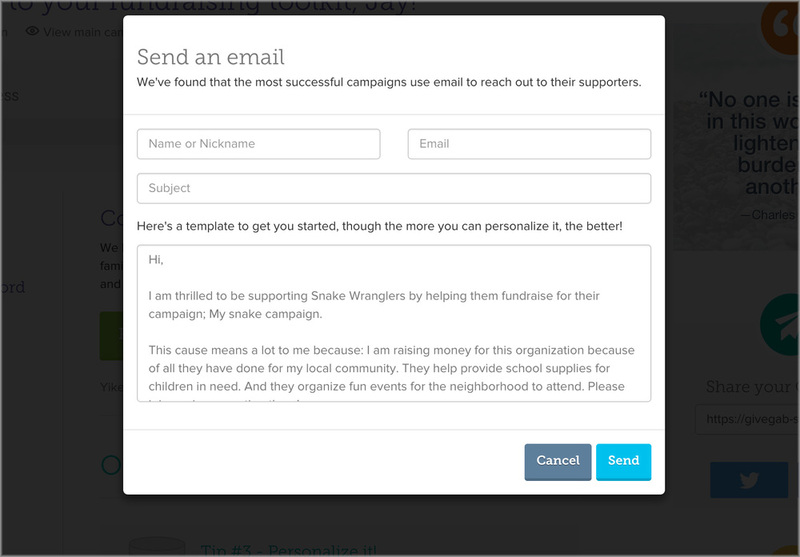 Fundraisers are given tools to reach out via email and social media to their supporters. Beyond just messaging, these tools help keep track of who received a message, who donated, and who still needs to be sent a “Thank You” message. We also have a section of interesting tips to help them along the way. Fundraisers can even submit a tip to help out fellow fundraisers. We’ve added some stickers to reward fundraisers who are successful. Stay tuned for even more features next month. In the meantime, if you have any fundraising experience, please share it with us. We’re always looking for feedback on how we can make GiveGab better!